If you have never tried needle felting before, it is a fabulous crafting technique that allows you to create realistic animals and adorable characters with colorful and soft textures. 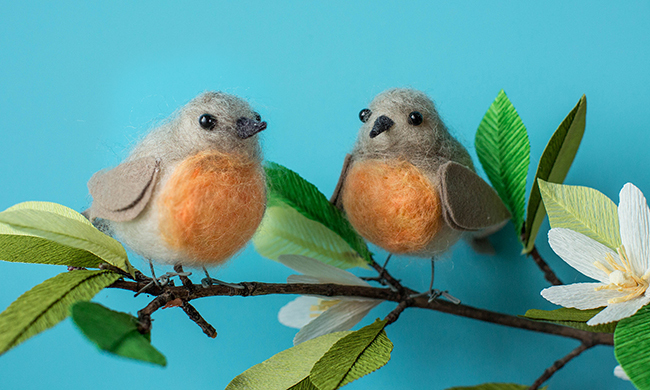 A really popular project in the world of felting is needle felted birds. We have created a collection of bird projects on the site in the past, and now we are sharing this video to give you some of the basic techniques that you can use as guidance for introducing yourself to needle felting! In the video I craft up a felted robin to demonstrate our techniques for needle felting for beginners. Follow along with the video below to start becoming a needle felting master! Felting purists will make their needle felted birds completely out of roving wool, but our favorite needle felting “hack” is to use a foam egg as a base for the bird body. It makes it so much easier to form the bird shape, and you end up using much less wool. Of course you’ll also save a lot of time using this method. Depending on the shape of the bird, you can tweak the curves of the foam egg by grinding it against your table. Wrap the wool around the foam and begin poking your felting needle into the foam. The hooks on the needle will push the wool bits into each other so that they become interlocking. Do this until your wool is woven tightly together. Feel free to add multiple pieces of wool as you go – there is no need to use only one piece of wool to completely cover the foam. 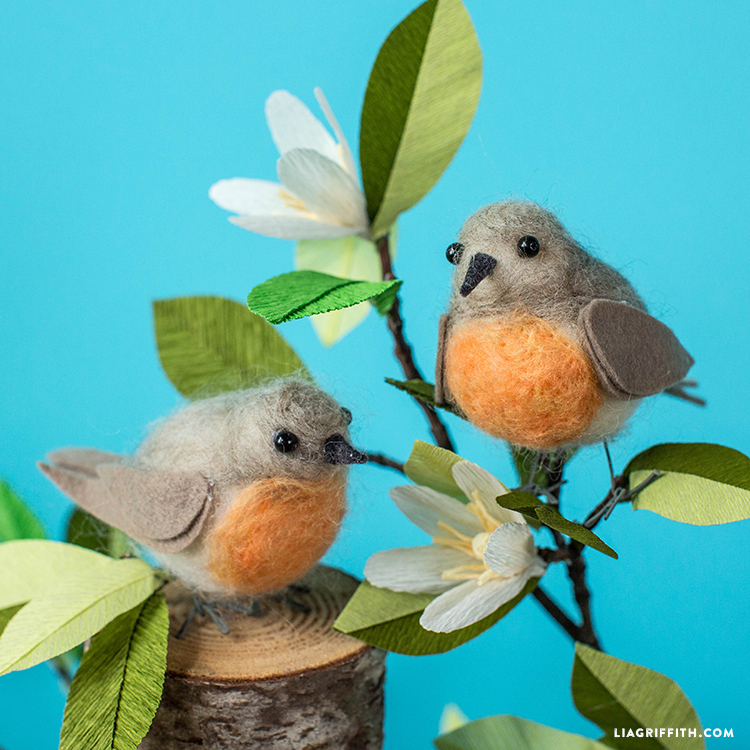 If you are using the foam ball method for making needle felted birds, you will want to replace your needles regularly. Foam breaks down the barbs on the felting needle, and if your needle is dull, it won’t weave the wool together while you craft. Because you are saving a good amount of money by using less roving wool with the foam ball method, we found it to be a good trade off to spend a little more money on extra needles. We invested in this really affordable 60-pack from Amazon that should last us for years to come. I like to use the analogy of painting – add different colors of wool one layer at a time. Simply form the wool into the basic shape you want it to be (like the circular chest piece), place it on top of your egg and start poking away. When you’re finished, there may be some visible poke marks in the wool, but you can just use your fingers to ruffle the wool a bit. How do I get the pattern for the robins wings and tail? There’s a button at the bottom of the post (under the last large photo of the two birds) that says “Felted Wool Robin Pattern PDF”– click that, and the PDF will either open in a new browser window or download directly to your computer. When I first saw your tutorial on these sweet birds, I wanted to try but did not understand the technique. Your video is very helpful. I am ready to give it a go. My house is full of flower arrangements inspired by you. Thank you for sharing your Passion!